There s’no man like our snowman! One of my favourite memories from childhood involves a snowman. I was probably no older than 10 or 11 and I remember having a LOT of snow that year. It was one of the first years my parents were divorced and my sister and I were at our dad’s house for his week of shared custody. My dad rented a little cottage on a lane back from the main road and behind us were other modest cottages and a few family homes, most of the cottages being vacant for the winter. We didn’t have money for sleds or skis but you didn’t need money to have fun in the snow and my sister and I along with a couple other neighbourhood kids decided we were going to make the biggest snowman ever. It probably wasn’t the behemoth I remember but it was pretty huge- I’m pretty sure one or more of the neighbourhood dads had to help us stack the snowballs for it. We assembled the monster of a snowman, gave him a face, arms and buttons but we didn’t have any clothes for the poor little guy. It was getting dark and frozen and wet we went inside for the night, SO proud of our masterpiece. When we got up in the morning, there was an amazing surprise waiting for us- At some point during the night our snowman had acquired a hat and scarf and they fit our giant guy to a T! We never found out who was behind it but not knowing made it that much more magical and I’ve loved snowmen since. 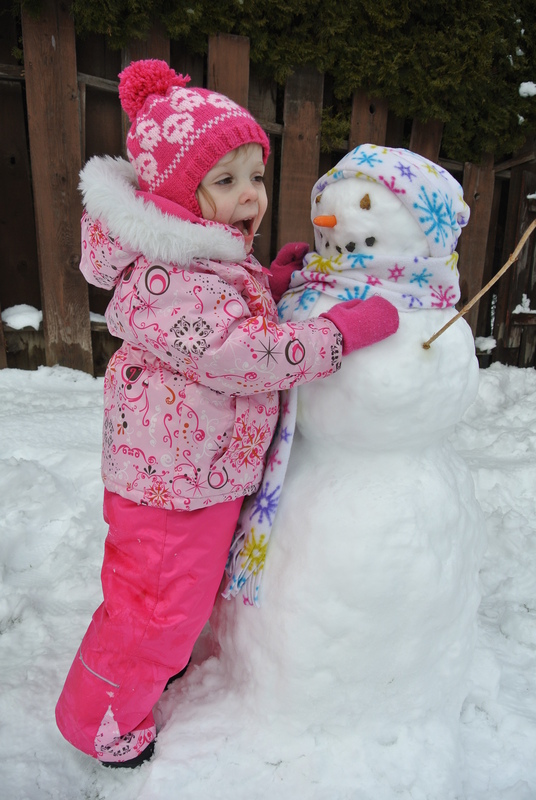 My two year old daughter is a little obsessed with snowmen herself. Today we had the perfect snowman making conditions. We’ve had a fair amount of snow fall in the last few days and it the temperature was mild enough that the snow was a sticky enough to pack it together. We got bundled up- just my little bee and I- and wandered out into the winter wonderland that is our back yard. 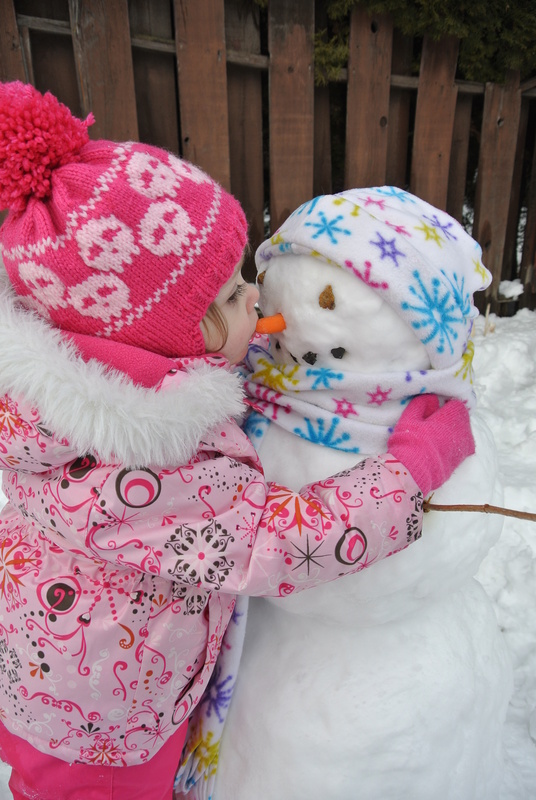 We worked together, adding and shaping the snow (I was surprised at how interested she was in helping, being so little) and had him put together before too long. “How does he look?” I asked my daughter as we were shaping him. “With a EYES” she told me matter-of-factly. He stands about just shy of 3′ tall- about the same height as my daughter. When we finished, she gave him a hug and a kiss on the nose and said “Wuv you sooo-man” (that makes my heart ache a little). I’m so glad we got out this afternoon. Here are a couple pictures of my girl and her new Snow friend. I’m not sure what he said but whatever it was, it was hilarious!